Pontoon is a variant of the beloved card game blackjack, which closely mimics the blackjack variant Spanish 21. There are two main versions of Pontoon, an Australian version (also played in New Zealand, Malaysia and Singapore) and a British version. The rules of Pontoon vary slightly between the two versions and may also vary from venue to venue, but generally follow the same format so differences are never difficult to pick up. Net Entertainment and BetSoft both offer online Pontoon which can be found at several of our recommended casinos to play in demo mode or for real money bets. This article will take you through an overview of Pontoon, details of how to play, and the different rules which apply to British, Australian and online Pontoon. Similar to blackjack, the objective of Pontoon is to receive a hand as close to a value of 21 as possible, without going over 21 (busting) and while beating the dealers hand. A hand made up of an ace and a 10 value card (10, J, Q, K) is considered a Pontoon and is an automatic win. A players Pontoon always beats the dealers Pontoon, and a player’s hand over 22 automatically busts regardless of the dealer’s hand. Pontoon can be played with two or more players, and when offered at a land based casino the Pontoon table may sit up to eight. Between six and eight standard decks of 52 playing cards are typically used, minus the jokers. Number cards are counted at their face value, with face cards counting as 10’s and aces counting as either one or 11. Once bets have been placed, the dealer deals two face down cards to each player and two face down cards to themselves, with no hole card. The dealer peeks to check for Pontoon before a player can choose to twist, stick or buy. The game continues until either player or dealer busts, reaches a hand of 21 or chooses to stick. While this is the standard play regardless of what kind of Pontoon game you’re playing, additional rules vary. We’ve outlined some of the major differences in Pontoon games below. These rules are typically the same rules used in online Pontoon games. NetEnt Pontoon Pro Series – an elegant online game using classic British Pontoon rules, NetEnt Pontoon Pro offers low stake, mid-stake and high stake betting options. Up to three hands can be played at once to maximise your winning potential and add further excitement to gameplay. The soundtrack consists of relaxing piano music which helps set the scene for a sophisticated online gambling experience. 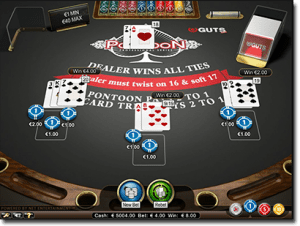 BetSoft Pontoon – there’s not a great deal of difference between BetSoft’s online version, other than the fact that standard blackjack terminology is used over Pontoon lingo (hit, stand, etc). Bets are also limited to a minimum of $1 and $100 per hand. To play online Pontoon, head to one of our recommended casinos and use the search function to locate one of the Pontoon games detailed above. You can try these games in practice mode for free, or sign up for an account with the casino to make a deposit and play for real money. Once the game loads, select your bet amount, use the mouse to place your chips on the betting table and press deal to watch the action unfold. After initial cards are dealt, use the buttons at the bottom of the betting table to make your next move. All wins are automatically credited to your account. Additional rules may apply depending on the casino, with land based casinos around Australia each offering slight variations on traditional Pontoon. Additional payouts are also offered where the players hand consists of three sevens in matching suits, and the dealers up-facing card is also a seven. Payout for this win depends on the bet in place. Note: most of these bonus payouts don’t pay after doubling.